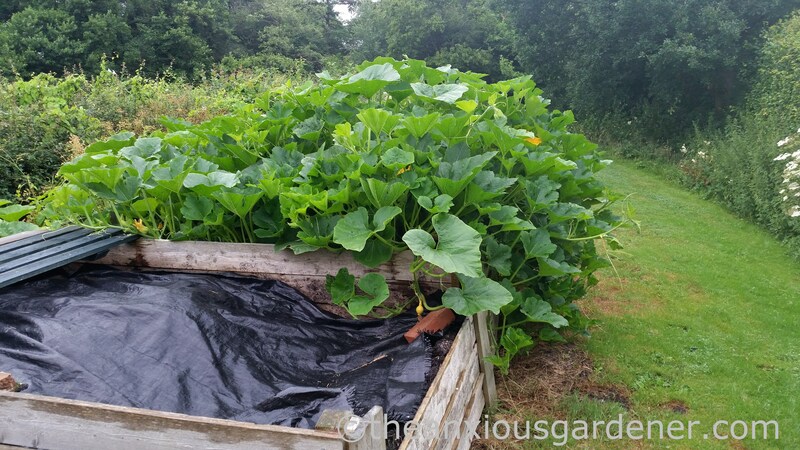 I’ve taken an obvious break from blogging recently but I wanted to quickly show you a pumpkin plant because … well, have a look. It’s content, isn’t it? I didn’t have space in the veg beds so rather than throw away six gift plants, I planted them in a compost bin. I watered on first planting but haven’t bothered since (it’s a long traipse out here with a watering can). Slugs had a field day with five but one proved that he won’t be messed with by the slimy folk; and easily grabs The-Biggest-Pumpkin-Plant-I’ve-Ever-Grown crown (cardboard, baking-foil over-lay, as yet unmade). Aren’t you meant to take off all the flowers bar one? To grow the best, biggest pumpkin? Perhaps, but I’m just enjoying the spectacle of a plant relishing its site and showing off … (if sucking all the goodness out of my lovely, precious compost). I wonder how big it will grow? The bin is 1.6 metres wide, 2.4 metres deep and 90cm high; the compost a year old. No wonder it is so thuggishly happy and already swamps two bins. It’s a shame that I’m not too keen on actually eating pumpkins. They’re palpable, I suppose, and Jim continues to buy them despite my lack of enthusiasm. I far prefer his Halloween endeavours to his pumpkin soup/curry/surprise (extra pumpkin). Maybe I will remove all the fruit except one and nurture the largest, scariest, carved and illuminated pumpkin imaginable for our window on 31st October (though I dare say I’ll be eating the innards for weeks afterwards, sadly). So yes, it’s all been quiet on the blogging front but I have been busy. Painting our new house, planning works with our builder, toiling in our garden, enjoying a holiday (which might merit a post, might not) and I’ve also received several interesting proposals via the blog too. One of those was writing an article for Capital Gardens: if you missed my plug on Facebook and Twitter, you can read it here. Pumpkin will settle a dog’show stomach. 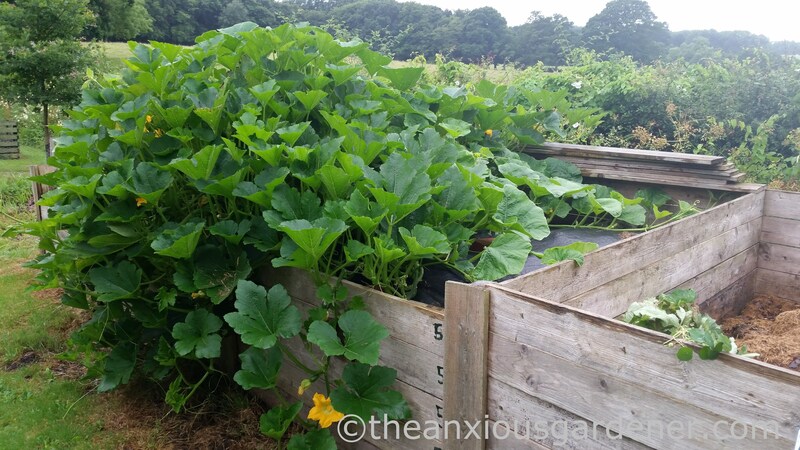 Crate of Sussex pumpkins coming your way, Debbie. At least with growing your own pumpkins, Jim won’t have to buy them. I mean, you still might not enjoy eating them, but at least you won’t be out any money. That always adds insult to injury somehow. David, have you tried pumpkin pie? I know some people loathe it. Sliced and roasted with chilli and lime zest is not bad. But the plant is beautiful, leave it be. And the carving is terrific – did it’s eyes follow you around the room? That is a most impressive plant! 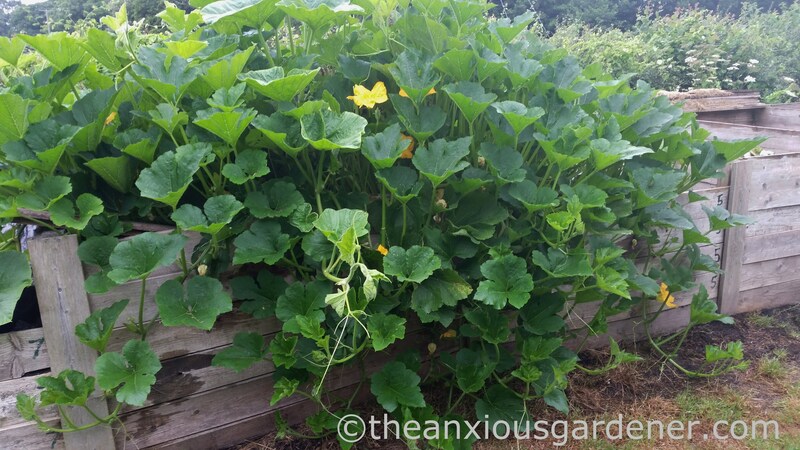 I have been similarly swamped by the growth from the tromboncino squash – but they fortunately are delicious. I do agree with you about pumpkin. 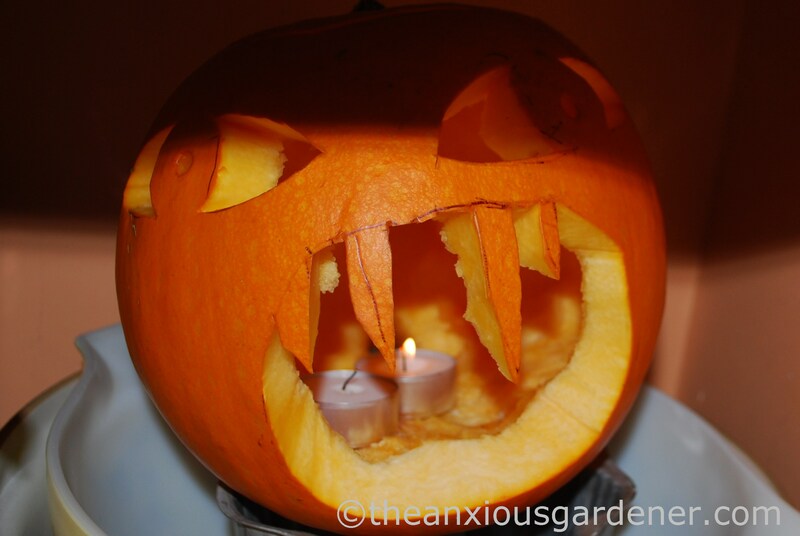 Best carved, lit, then composted!